If you think too much about Limitless — a new thriller about a pill that enables its takers to access every part of their brains — you’ll probably fall headlong into a plot hole or find yourself puzzling over whether this or that action by its main character makes sense. Not nearly as stylish or tricky as Inception — kind of a distant cousin — Limitless still manages to establish itself as more creative than the average March movie. Better yet, this energized, mind-bending fantasy doesn’t stint when it comes to reveling in the sheer joy of winning. And, yes, it’s generous about sharing the fun. The setup is plenty enticing. 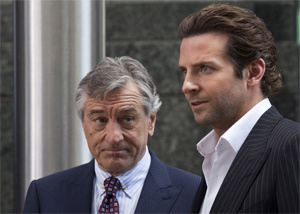 Eddie Mora (Bradley Cooper) is a New Yorker whose life is going nowhere. Eddie has a book contract, but hasn’t written a word. He has an ex-wife (Anna Friel) he hasn’t seen in years. His current girlfriend (Abbie Cornish) has pegged him as one of life’s losers and is ready to move on. Eddie’s tiny apartment is as much of a mess as his life. One day Eddie bumps into his former brother-in-law (Johnny Whitworth). Whitworth’s Vernon says he’s working for a pharmaceutical company; he offers Eddie a pill that promises to change his life. Eddie initially resists, but eventually takes the pill. Wham! Eddie’s reborn. He cleans his apartment; he starts writing the novel that long had eluded him. He’s off and running on a success track. The pill’s effect, of course, wears off, leaving Eddie with a new and simple objective: Get more of the drug, which the movie calls NZT. Cooper, familiar to most audiences from The Hangover, makes Eddie’s transformation convincing as he blossoms into a guy who can master any task. Want to play piano? No problem. How about learning a new language? Ditto. Eddie dispenses information with the precision of a guy throwing a great game of darts, and Cooper makes it clear that being super-smart is both fun and addictive. Limitless also offers another bit of happy news. Robert De Niro does fine work as Carl Van Loon, a corporate giant who wants to use Eddie’s abilities to analyze a pending mega-deal. It’s great to see De Niro liberated from low-grade comedies such as the abysmal Little Fockers. Maybe there’s something left in his tank, after all. Director Neil Burger employs heady visual trickery to show Eddie’s drug-induced state, and screenwriter Leslie Dixon keeps the proceedings lively by attaching a variety of twists to the main plot. At one point, Eddie gets crosswise with a Russian mobster (Andrew Howard). Later, he’s implicated in a murder that’s handled so hastily you may have forgotten it by the movie’s end. That’s the trick: Limitless employs speed to great advantage. It moves quickly, encouraging us to enjoy the excitement of Eddie’s meteoric rise, even as we wonder whether he can sustain his super-charged acuity. Limitless may not dot every “i” or cross every “t”, but the filmmakers seem to be betting that they’ll score enough points - including one bit that’s guaranteed to leave an audience buzzing — to keep us from over-thinking what we’ve seen.